Advanced Bionics proudly offers ClearVoice™*, the industry’s first and only sound processing innovation that enhances speech understanding. ClearVoice is also the industry's only sound processing technology that has been clinically proven to deliver superior hearing performance in noise. The clear choice for confident communication, ClearVoice provides you with the unique opportunity to converse more effortlessly in noisy settings, understand your favorite song lyrics, enjoy the world around you, and hear your best at any moment and any place your day takes you. Built on AB’s proprietary HiRes Fidelity 120™* technology, ClearVoice has been designed to automatically analyze and adapt to each listening situation that you encounter throughout the day, separating the distracting noises from what you want to hear most—speech. This sophisticated technology has been developed to help you communicate clearly and easily in challenging listening situations, including restaurants, cars and classrooms—without making adjustments to your sound processor. The real world is full of sounds from a variety of sources that compete for your attention. Clinically proven to deliver superior performance, only ClearVoice separates the distracting noises from the voices you want to hear so that your conversations can be enjoyed more easily and with more clarity. Following along to lyrics can be a challenge for cochlear implant recipients. Always focused on advancements in hearing performance, AB developed ClearVoice to help you understand your favorite singer on the radio. Designed for an effortless listening experience in everyday settings from quiet to loud environments, ClearVoice helps you relax and hear your best without needing to change a program on your processor. As the industry’s innovation leader, AB continues to deliver advancements in hearing performance. ClearVoice is the only speech enhancement technology that helps recipients hear and communicate with confidence. 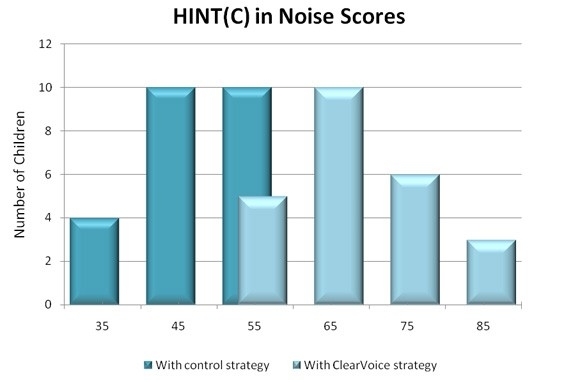 Initial results in adults using ClearVoice showed improvements in the ability to hear speech in noise.6 The Cochlear Implant Program at the Children’s Hospital of Eastern Ontario in Ottawa (CHEO), Canada, wanted to see if the same benefit could be seen in children. Twenty four children already using Harmony processors with HiRes Fidelity 120 were tested with and without ClearVoice enabled. 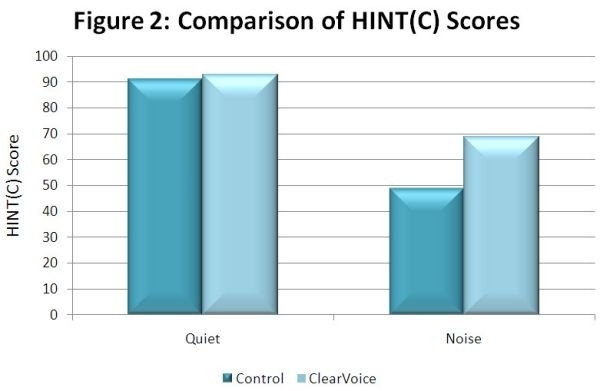 The results show a significant improvement, with more children achieving higher scores in noise.7 In noise, the children’s mean scores increased from 48% without ClearVoice to 67% with ClearVoice. ClearVoice is available for CII or HiRes 90K™ recipients using HiRes Fidelity 120™ sound processing with a Harmony™ or Neptune™ processor. *Not approved for pediatric use in the United States. Advanced Bionics. (2012) HiResolution Bionic Ear System Instructions for Use. Koch DB, Osberger MJ, Segel P, Kessler DK. (2004) HiResolution and conventional sound processing in the HiResolution Bionic Ear: using appropriate outcome measures to assess speech-recognition ability. Audiology and Neurotology, 9:214-223. Cochlear. (2009) Nucleus Cochlear Implants: Physicians Package Insert. Schramm D, Pickard E, Beauregard Y, Moran L. Evaluation of the ClearVoice Strategy in Children using HiResolution Fidelity 120 Sound Processing. Poster Presentation at the 11th International Conference on Cochlear Implants and Other Implantable Auditory Technologies, Stockholm, SE. June 30-July 3, 2010. Mathias, N. & Arnold, L. "Preliminary Results of the ClearVoice Evaluation in Adults," Advanced Bionics Europe, 2010. Wolfe, J. et al, "Evaluation of Speech Recognition in Noise with Cochlear Implants and Dynamic FM," Journal of the American Academy of Audiology 20:4099-421, 2009.